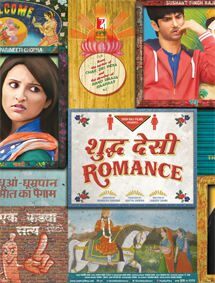 The film Shuddh Desi Romance coming from the stable that believed in all the romantic cliches possible for the longest time. Times are changing, the youth today considers marriage just a societal norm confounding the idea of love and confining two people into a prison of societal legalities. The present generation is all about exploring, not just themselves but even their partners till they turn cent per cent sure about them. Who would've thought that the man who reveled in the ideology of marriages in Band Baaja Baaraat would present such a modern take of the present small town romance? But Maneesh Sharma surprises you by showing some of the most vulnerable realities of the current general. Stuck in a stuffy rustic bus that's going to the marriage venue Raghu Ram Sitaram (Sushant Singh Rajput) is suffering from pre-marital jitters just while developing a new attraction towards his fake sister Gayatri (Parineeti Chopra) among the fake baraatis. Just while discussing his problem he ends up kissing her. But unlike the coy women of the yore she doesn't make a hue and cry about it and asks him to consider it his problem and forget about it. But Raghu doesn't and instead runs away from his marriage venue leaving his would be bride Tara (Vaani Kapoor) stranded. He then chances upon a meeting with Gayatri again, attraction gives in to liking and the two start living in, as a logical (rather societal) next step they decide to marry but uncertain of a guy who runs away from his own marriage, Gayatri dumps him on the marriage night and runs away too. That's when comes the re-entry of Tara and in inexplicable circumstances the two hit it off. Things are going fine till Raghu finds himself in a love triangle when Gayatri decides to make a U-Turn. The idea of presenting the insecurities of the young hearts is absolutely brilliant. However, it's the execution of it all that takes a hit bringing the film down. The movie, although breezy in the first half, slumps never to rise again in the second. Moreover, it's the repetitive nature of the storyline in the second that leaves you extremely disappointed. Sushant Singh is a nothing but Ranveer Singh of Band Baaja Baaraat. One wonders what the guideline must've been by the director to Sushant, ape Ranveer? For the actor who despite tremendous potential and looks that can leave women weak on their knees gets mired by a repetitive performance. Parineeti Chopra too should stop taking up roles that appear exactly like her debut film. There's no novelty in her role this time around as well. Debutant actress Vaani Kapoor doesn't impress either. One only finds her smiling in every scene irrespective whether it demands her to or not. To sum it up, Shuddh Desi Romance packs a brilliant concept of modern day relationships in a garbled and repetitive packaging.